Senior Services sent us a Thank You letter for our Christmas in July donations. Now that we are in the Holiday season, it is time for the Real Christmas in December collection. Consider Target cards ($5-10), incontinence protection products, travel size soaps and shampoos, and other toiletry items. The club also has fabric and batting for the production of lap quilts. Our raffle quilt is finished and it is beautiful! Tickets are available. We are asking that each member sell at least $20.00 worth of tickets for the quilt. $1.00 per ticket, $5.00 for 6 tickets. The winning ticket will be drawn at our November holiday meeting. For every $20 of tickets you sell, you will be entered in a drawing for a bag of Lee Monroe goodies. Thanks, Lee for the donation! 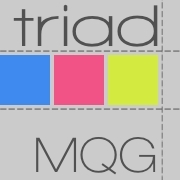 2019 TMQG membership dues are $40. Members who joined or rejoined in September, October, and November will be entered in a special drawing for some of Lee's fat quarter stash. The October meeting was a round robin of member demonstrations. Amber demonstrated some new products including Japanese engineered scissors that cut smoothly all the way down to the tip, an expanded rigid foam block which is great for removing loose threads and dog hairs, and a seam ripper that does not cut the fabric. Colleen demonstrated her "in the hoop" embroidery on vinyl she is using to make key chains and lip balm holders. She had a great handout with supplier contact information. She ended up selling a good portion of her on-hand stock after the meeting. Muriel demonstrated her techniques for making Sculpey clay into beads, flowers, and strawberries. She molds these around the heads of corsage pins to decorate her pin cushion swap items. She also gave baking instructions to set the clay. Although she said these beads are easy to make, she really has a knack for them. Thanks to all the members who entered quilts in the exhibit and in the juried show. We had a wonderful sampling of modern quilts and Lee Monroe had a trunk show which had a great attendance. Our members earned several awards. Photos of our member's work was posted on our Facebook page. Check it out! See you all on Tuesday, November 27, at the South Fork Recreation Center. We start eating at 6 pm!